The human-powered vehicles varied greatly in their aero slipperiness. Worst were the conventional recumbent trikes, about as aero slippery as bricks! Best were the fully-faired vehicles – extremely slippery not just in comparison to their unfaired competitors but also in absolute terms. Half way along the main straight, and on pedal power alone, the best vehicles were achieving speeds of 40 km/h. (And incidentally, doing this for a full 24 hours of the race – it’s a stunning event.) By standing close to a barrier, I could be within a metre of them as they whizzed past. Vehicles like the one pictured below clearly disturbed the air; the vehicle would shoot by, there’d be a pause, and then you could feel the turbulence. But when this machine rocketed past (pictured is the winner), there was a pause – then nothing! It was downright eerie, waiting for the air motion and then experiencing nothing that was discernible. Even stranger was the expectancy that, with the vehicle’s higher speed, you’d feel more buffeting – not less. When is an electric bike not a bike? Don’t stand too close to the trucks Julian!! 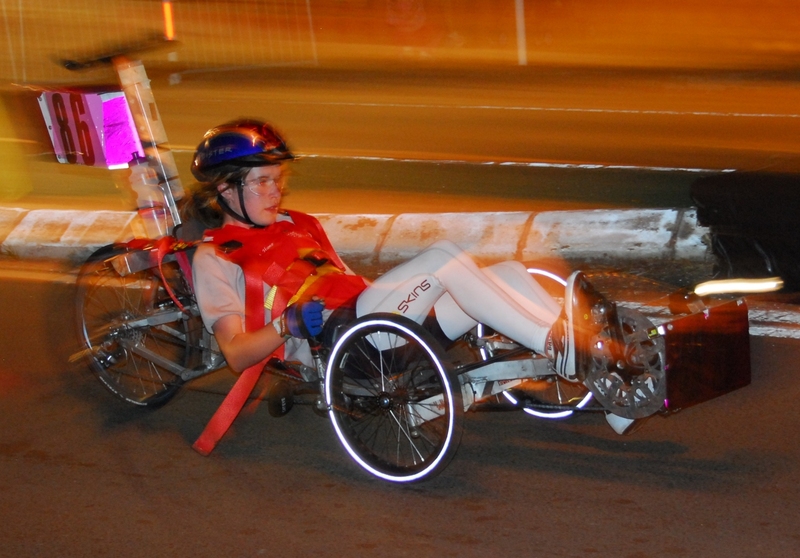 Perhaps you need to design and trial aerodynamic fairings as a follow-up to the recumbent trikes you’ve built?? Having just come back from holiday you really feel the difference between truck types. Flat-nose (COE) rigs with a big box trailer buffeted the little hatchback around no end, flat trailers and/or conventional trucks much less so. Wakes are interesting. The aircraft guys use a “drag rake” which is a vertical array of pitot tubes to measure the wake behind a wing. A car would be harder, but a light skinny trailer carrying an array of pitot tubes could measure the wake directly and thus the actual drag. Just put the wheels back far enough not to disturb the flow at the measurement point, and you have a wake trailer. The flow under the car would confuse things a bit, but if you are working on improvements on the upper part of the car, it might work very well and be cheaper than a wind tunnel test.